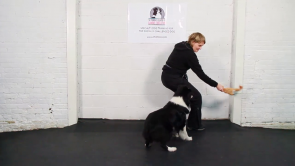 Mirkka Koivusalo of The Toronto Centre of Canine Education thetcce.com demonstrates how to train Sacred Recall, which is teaching your dog to come when called. You choose a word which is not “Come” or “Here” as dogs have a history of already ignoring this word. Stage 1 – Say your chosen word, rewarding your dog immediately after saying the word. Stage 2– Say your chosen word when the dog is not looking at you, and reward when your dog responds to the word by looking at you. Stage 3– Say your chosen word while moving away from your dog and from a distance, and reward when your dog responds to the word by looking at you.